For those in the know of Austin’s fashion scene, a familiar face is State-side again. For those new to Austin, fashion, or Austin’s fashion, a local legend walks these streets. She owns the unique shop on SoCo, Blackmail. She’s an instructor at UT’s Textile & Apparel Dept. Gail Chovan is not big on the word fashion, nor the fast-paced cycles of the global institution the fashion industry has become. She is, in her own terms, a clothing artist. That has never been more clear than now. "Le noir n'est pas si noir" or "The dark is not so dark"; the definition of Zelda's experience of this modern world. of hope and cathartic release. Consisting of 24 pieces, ranging in price from $300-$5,000, the dramatic use of lighting in the gallery space eloquently captures the essence of experience. On walking through the exhibit, the first piece might at first be overlooked, but upon closer inspection, wonder at how it was missed is inevitable: "Mordant ($1200)," plaster and gold teeth. Walking down a dim hall, the next piece is the line of poetry in French neon, and around the corner, in English neon. The next turn opens up the main hall. 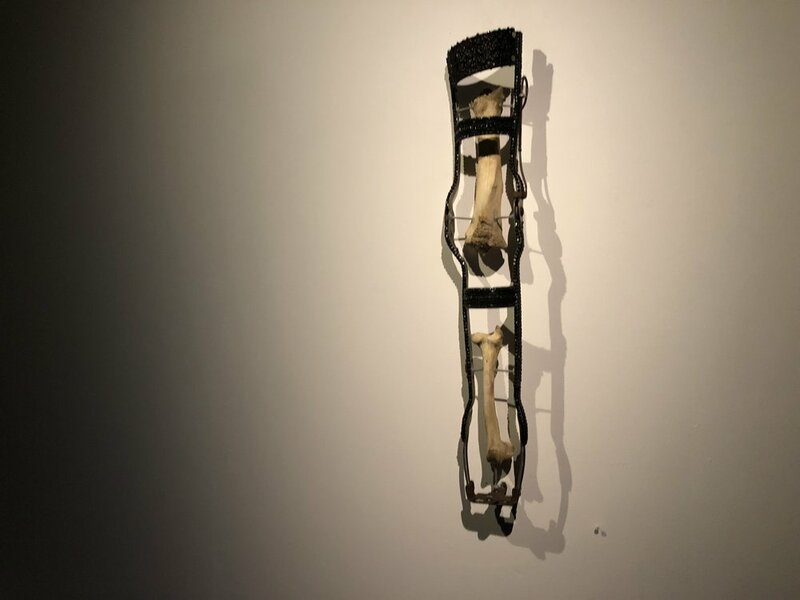 Mirrors, human hair, Victorian & Edwardian clothing, hand-stitched kid gloves, neon lights, even bones are incorporated into these delightfully macabre pieces. Mrs. Chovan even conducted a brief Q&A session, which shed some light on her work and her experience in making this collection. Q: How do you feel about being an independent designer now, in this time when we don’t have independent boutiques? when they go off on that trajectory of fast fashion. Its always been a part of who I am and it will never change. Q: How did the project change from your original inspiration to demonstrate Zelda’s experience? A: My first idea was to make clothing that used four senses except for sight. That just morphed, I found myself forcing myself to do that until I realized, “What do I love?” I love detritus and I love, you know, shattered fabrics and I love all of these little pieces and I love working by hand. All these things are stitched by hand with no pattern, free-stitching so some of the words are askew, the letters are misshapen, so it definitely morphed. Feel free to touch anything, except the neon. Q: Does the #MeToo movement influence your future projects? Q: How do you see the fashion industry here in Austin? How do you market yourself? that are, these things are 100 years old, and maybe I’m the last person who thinks about that, but I think everybody here has a bit of appreciation for the lasting pieces. Q: Were you interested in black before Zelda? A: Yes, I’ve been interested in black since the 80s in design school in Paris when the Japanese designers were coming to light. I’m very interested in form and shape and texture and not so much promotion of color. As for Zelda’s thoughts on the exhibition, she expressed gratitude for everyone coming out to experience her mother’s work. The pieces “are not fragile” at all and she is excited for the public to experience a piece of her world. Questions were asked by attendees of the opening reception, including this journalist. “No Trace of Now Will Remain” is open to the public from January 20th to March 1st at Women & Their Work Gallery. According to the accompanying Artist’s Statement written by Seth Berg, the works appearing in this exhibition were created as the artist viewed Scandinavian crime dramas. Kaitlin W. Blaylock has devoted her life to the art of the story. An avid reader, an overdeveloped sense of curiosity, and an uncurbed imagination lead her to seek truth and speak for those who are ignored, marginalized, or speechless. She started her career at the middle school newspaper and an afternoon Boys & Girls Club radio program. With a B.S. Communications and M.A. Fashion Journalism, Kaitlin filters through a lens of culture, art, and fashion. She is a Steampunk, a member of the Eastern Band of Cherokee Indians, and obsessed with information. Kaitlin lives in Austin, TX with her boyfriend and Miss Rose, an 11 year old Yorkshire Terrier."